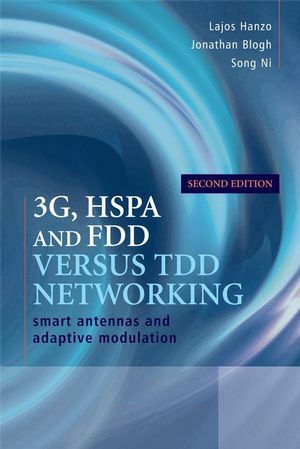 3G, HSPA and FDD versus TDD Networking, Second Edition is the only book that contrasts the network capacity gains that may be achieved with the advent of adaptive antenna arrays and HSDPA-style adaptive modulation techniques in the context of FDD and TDD CDMA cellular networks. In the five years since the first edition of this book was published the wireless landscape has evolved further. The new book addresses the recent developments in the field of HSDPA-style wireless networking, focusing particularly on the issues and challenges of FDD versus TDD networking. These solutions are particularly powerful in shadow-faded scenarios, when the antenna array elements experience correlated, rather than independent fading. Furthermore, the flexible up-link/down-link time-slot allocation of TDD is beneficial for supporting the Wireless Internet, but results in erratic interference fluctuations, which is efficiently combated by the antenna arrays and adaptive modulation. Additionally, whilst the adaptive modulation aided system simply drops the instantaneous transmission rate during instances of high interference, conventional networks would drop the call. Provides an all-encompassing self-contained overview of the subject for a wide range of readers of all levels. Treats the topics of both physical-layer and network-layer aspects of wireless systems using a cross-layer optimization approach. One of the first books to contrast in detail both FDD and TDD networking. The material is presented clearly and logically allowing the uninitiated reader to commence reading it at fundamental non-mathematical conceptual level at the beginning of the book, while advanced readers can turn directly to the required chapter describing solutions to a number of wireless FDD or TDD networking problems. This book will inspire researchers, practicing engineers, operators, marketing engineers and advanced postgraduates. Dr Lajos Hanzo is Professor of Wireless multimedia communications in the School of Electronics and Computer Science at the University of Southapton. He has over 30 years experience in communications and has held various academic posts in Hungary, Germany and the UK. He has been a member of the academic staff at Southampton University since 1986 where he currently holds the Chair in Telecommunications. Professor Hanzo has published 12 titles with Wiley/IEEE and has published about 700 research papers. Dr Jonathan Blogh received a Ph.D. degree in mobile communications from the University of Southampton. His current areas of research include the networking aspects of FDD and TDD mode third-generation mobile cellular networks and he received the Lord Lloyd of Kilgerran Memorial Prize from the Institute of Electrical Engineering, U.K., in 1997 for interest and commitment to mobile radio and RF engineering. Dr Song Ni received his PhD from the School of Electronics and Computer Science, University of Southampton. Formerly of Multiple Access Communications Ltd in Southampton where he was an engineer working on assessments of 3G standards-related patents. He recently moved to Panasonic UK. He has published several journal articles.